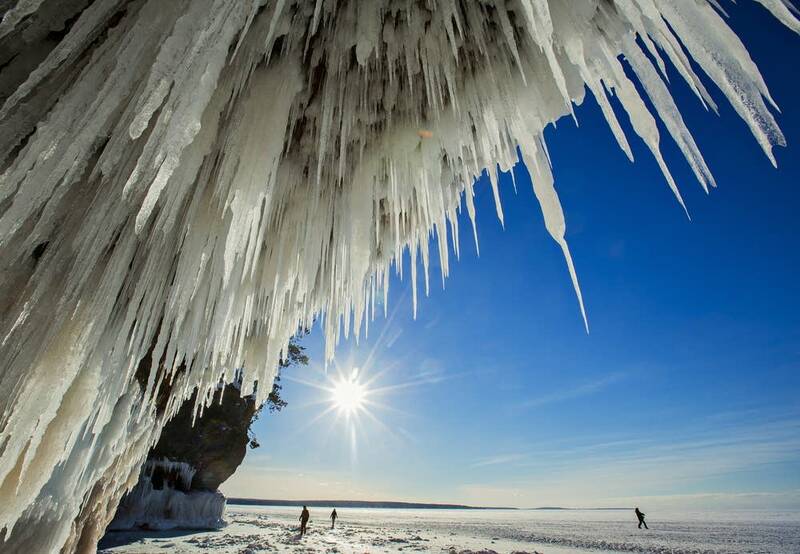 The ice caves along Wisconsin's Apostle Islands National Lakeshore will open to the public Saturday, assuming conditions don't change. The ice caves drew a crush of visitors — more than 138,000 people — last year when the deep freeze made it possible to walk out to the caves for the first time in nearly five years. Calvin Alexander of the University of Minnesota, joined MPR News' Tom Weber to explain how the ice caves differ from other cave formations. "These are a minority group of caves," said Alexander. "Most of the caves in the world are in limestone and dolomite, and that's like Mystery Cave and Niagara Cave and Crystal Cave here in the metro area." The Apostle Island caves, however, are in sandstone. "They are produced by wave action — waves bashing against the rock cliffs excavate the caves. This kind of cave occurs any place you have big waves and the right kind of rocks, but there's not a lot of them." The Apostle Island caves are sometimes referred to as sea caves and other times as ice caves; During the winter, they are both. "Sea cave" is a general classification for caves formed by waves. "Ice caves" simply refers to caves that have ice in them. When the ice melts and summer comes, the Apostle Island caves will be just regular, if somewhat rare, sea caves again. Those who want to wait for warmer weather can explore the caves by kayak.